The Tulameen is one of the better known gold-bearing rivers in Canada's beautiful province of British Columbia (B.C.). 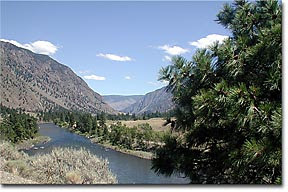 The river originates in the Cascade Recreation Area of southwestern B.C. until it merges with the Similkameen River near Princeton, an colorful old mining town containing about 2,700 souls at last count. The lower stretches of the Tulameen in the vicinity of Princeton have long been noted for producing large amounts of placer gold as well as its pricier cousin, platinum. Additionally, the upper stretches of the Tulameen including the area around Champion Creek have been good placer gold and platinum producers as well. The gold and platinum found in and along the Tulameen were deposited primarily in old river channels that, in some instances, were left high and dry a short distance from the Tulameen's present watercourse. Most of the placer gold recovered from the Tulameen exhibits a range of characteristics, including coarse, angular pieces as well as the more familiar water- worn rounded or flattened nuggets and flakes. Be advised, however, that occasional large platinum nuggets have been recovered from the Tulameen in the past and most black sands resulting from panning or mining operations along the river will contain finely-grained gold and platinum to the micron scale. Along the lower stretches of the Tulameen the ratio of gold-to-platinum recovery runs approximately 4:1, but the farther upstream one goes this ratio can be as low as 2:1. These are excellent ratios, by the way. I know I'd be happy with with either ratio since I don't think I've knowingly recovered any platinum in over 30 years of small-scale mining. Over time, systematic sampling of Tulameen black sands has indicated mixed gold and platinum values of nearly 1 troy ounce per ton. These sorts of values are highly workable from a commercial standpoint (providing they remain consistent) and also indicate potential for small-scale miners who know their stuff and are adept at finding areas of gold/platinum concentration. So there you have it. I've always wanted to travel to B.C., see that wondrous country, and maybe try my hand at a bit of gold and platinum mining before I cross that final divide. If you liked this post, you may want to read: "Gold Mining Questions and Answers: Part 15"
Canadian miners take heed: please take note of this information and do not trespass or attempt any panning or mining activities without permission. J.R.